During the last few weeks I’ve encountered two rainstorms in the desert. Both storms were less than a deluge and lasted around fifteen minutes. I rode out of the first on Route 66 in Arizona, just west of Seligman, and my clothes quickly dried as I continued riding. The second wet ride ended because I reached my garage. During both rides a new leather jacket, a Unik, kept me dry from waist to neck. I thought that the new jacket had been treated with some sort of waterproofing when it was made, and that the waterproofing had held up well. After the second ride in the rain I began thinking about treating all of my leather riding gear with Mink Oil. Winter is on the way and that is the rainy season here, such as it is in the southwestern deserts. 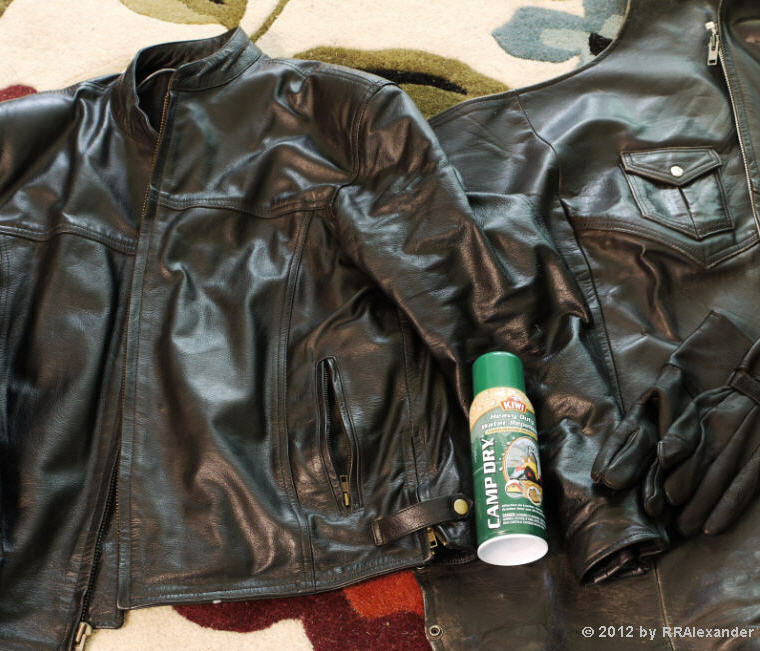 I hadn’t treated my leather since the previous year, so it was the perfect time to get ahead of the coming weather. 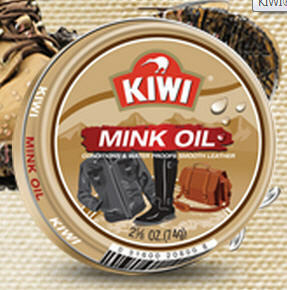 I went to a local sports gear retailer, but they were no longer carrying the Mink Oil. Mink Oil is more of a leather treatment than a water repellent, supposedly replacing oils in aging leather. I believe the mink oil does just that because after eight years of mistreatment coupled with yearly Mink Oil applications, my chaps still seem as soft and supple as when they were new. What the store did have in stock was another product by Kiwi, Camp Dry, a heavy duty water repellent. Camp Dry comes in an aerosol can. I read the information printed on the can, and trusting Kiwi, I took one home. I hung my jacket, chaps, and gloves on wire clothes hangers in the garage and sprayed the repellent on near the large car door (the spraying needs to be done in a well-aired space). Because the directions indicated that the treatment should dry for 4 hours between coats, it took me a couple days to apply several coats on everything. I used up one can and went back to the store for a second. I now have 5 coats on my jacket, chaps, and gloves, and three on the riding boots I wear in the winter. The treatment didn’t discolor my black leathers, all from different sources. This type of silicone coating will probably be a better barrier to water, but I won’t know until I get caught in a rainstorm or two during the next few months. My reasons for going with a relatively heavy waterproofing are fairly non-rational. I don’t like carrying rain gear in my saddlebags because the pants and coat combination take up a lot of space. The rain gear is also a pain in the posterior to put on at the side of the road, particularly the pants. Half of the time when I get surprised by rain on the road I don’t have the rain gear with me, anyway. And most of the time when I do get caught, the falling water doesn’t last more than a half hour. It seems reasonable to think that with sufficient waterproofing of gloves, boots, jacket, and chaps, which I always wear in the winter, I’ll make it through anything but a deluge (you know: raining monkeys and elephants) with a minimum of discomfort. If it turns out that this repellent treatment is less effective than indicated by Kiwi, I’ll report on that in a post this winter.